ASDIP STEEL is a structural engineering software for design of steel members. ASDIP STEEL software includes the design of steel and composite beams based on the AISC 360 provisions. Following is an overview of the required steps to design steel and composite beams using ASDIP STEEL. This structural engineering software has a built-in database of the AISC steel sections. Enter the span dimensions and properties in the Steel Beam tab. Specify the location of the lateral bracing points. Specify whether the supports are pinned or fixed. ASDIP STEEL presents a summary of results, organized by topic. Use the Slab/Deck tab to specify the concrete slab, metal deck, and shear studs. Specify whether the beam is composite or non-composite. Specify the partial composite percentage. 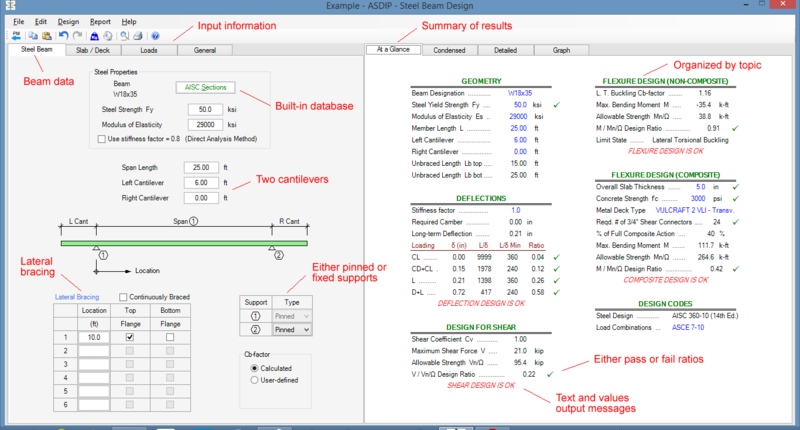 ASDIP STEEL includes a Condensed presentation of results, organized by topic. ASDIP STEEL performs the design per either the ASD or LRFD methodology. Specify either load cases, or pre-combined loads. Specify the distributed and concentrated loads, and end moments in the Loads tab. 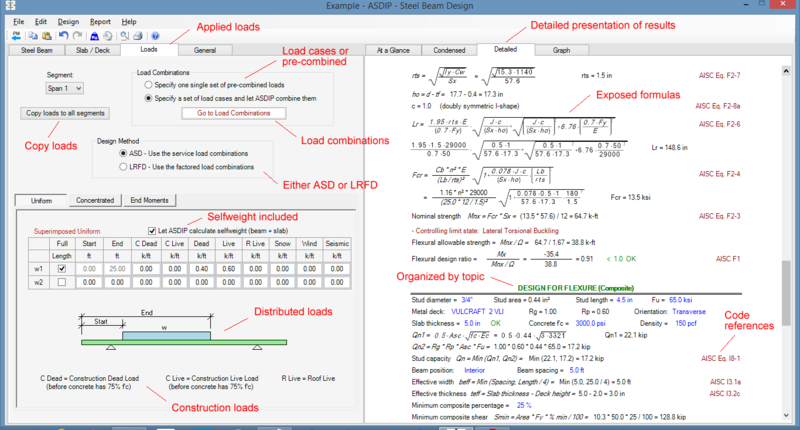 Detailed tab showing step-by-step calculations organized by topic, with exposed formulas and references to the design Code. Specify whether the selfweight will be calculated internally. Specify construction loads, and loads for the structure in service. Copy loads to other segments if necessary to simplify input. 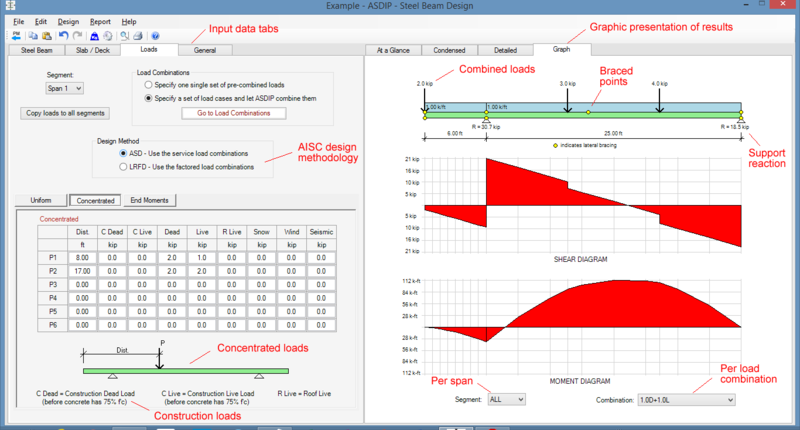 ASDIP Steel shows graphical images of shear and moment diagrams, per span and load combination. 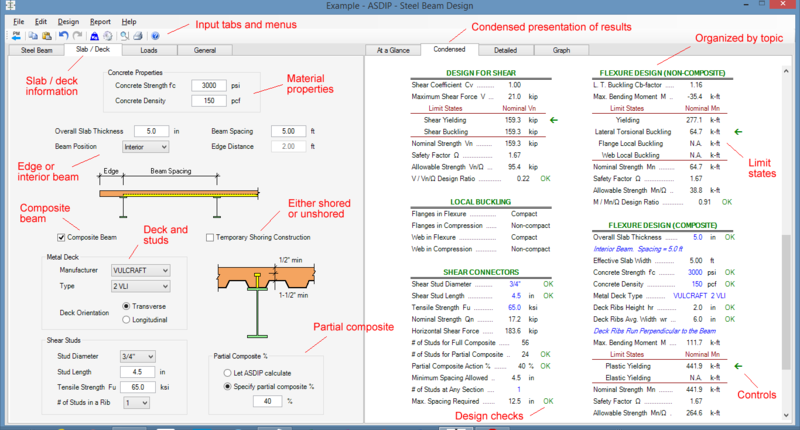 Use ASDIP STEEL Design Manager to find all sections that pass the design checks. Specify the height limits and populate the table. Sort the table by weight to find the lightest sections. Accept the selection to update the results with the new section. ASDIP STEEL has a module to design steel / composite beams quick and easily. It includes great features such as pinned / fixed supports, partial composite, end moments, pre-combined loads, and optimization tools. Detailed information is available about this structural engineering software by visiting ASDIP STEEL. For engineering background, please read my blog post Steel and Composite Beams: A Design Overview.